A lice infestation, or pediculosis, is caused by parasites living on human skin. Lice are tiny, wingless insects with sucking mouthparts that feed on human blood and lay eggs on body hair or in clothing. Lice bites can cause intense itching . Pediculosis capitis is an infestation of head lice. A body lice infestation is called pediculosis corporis. Pediculosis palpebrarum or phthiriasis palpebrarum, caused by crab lice, is an infestation of the pubic hair. Head lice live and crawl on the scalp, sucking blood every three to six hours. Their claws are adapted for clinging to hair or clothing. Adult head lice can be silvery-white to reddish-brown. They are about the size of a sesame seed. Female lice lay their eggs in sacs called nits that are about 0.04 in (1 mm) long and are glued to shafts of hair close to the scalp. During her one-month lifespan a female louse may lay more than 100 eggs. The nymphs hatch in three to 14 days and must feed on blood within one day. Nymphs are smaller and lighter in color than adults and become sexually mature after nine to 12 days. Body lice lay their nits in clothing or bedding. Occasionally the nits are attached to body hair. Body lice nits are oval and yellow to white in color. They may not hatch for up to 30 days. Nymphs mature in about seven days. Pubic lice have large front legs and look like tiny crabs. Females are larger than males. Nits hatch in about one week and the nymphs mature in about seven days. Lice are endemic in human populations, spreading through personal contact or contact with infested clothing or other personal items. They can be transmitted when unaffected clothing is stored with infested items. Among children head lice are commonly transmitted by the sharing of hats, combs, brushes, hair accessories, headphones, pillows, and stuffed toys . Pubic lice are sexually transmitted, although occasionally they can be transmitted through infested bedding, towels, or clothing. Lice do not jump, hop, or fly and they do not live on pets. Head lice cannot survive without a human host for more than a few days at most. Body lice can live without human contact for up to 10 days. Pubic lice can survive for one to two weeks without human contact. Head lice infestations are extremely common among children in schools, childcare facilities, camps, and playgrounds. They are the second most common communicable health problem in children, after the common cold , and appear to be on the increase. Some 6 to 12 million American children get head lice every year. In developing countries more than 50 percent of the general population may be infested. Although anyone can get head lice, children aged three to ten and their families are most affected. Girls and women are more susceptible than boys and men. Although American black children are much less likely to have head lice than white or Hispanic children, the incidence is increasing, particularly in black children with thick hair, hair extensions, or wraps. In Africa head lice have adapted their claws to the curly, elliptical hair shafts of blacks. Neither frequent brushing or shampooing nor hair length affects the likelihood of a head lice infestation. In general body lice infestations occur in crowded, unsanitary facilities, such as prisons and military or refugee camps. They usually are associated with poor personal hygiene, as may occur during war or natural disasters or in cold climates. They are common among the homeless. Lice infestations are characterized by intense itching caused by an allergic reaction to a toxin in lice saliva. The itching can interfere with sleep and concentration. Repeated bites can lead to generalized skin eruptions or inflammation. Swelling or inflammation of the neck glands are common complications of head lice. Body lice bites first appear as small red pimples or puncture marks and may cause a generalized skin rash. Intense itching can result in deep scratches around the shoulders, flanks, or neck. If the infestation is not treated, complications may develop, including headache , fever , and skin infection with scarring. A doctor may need to distinguish between body lice and scabies (a disease caused by skin mites) and between pubic lice and eczema (a skin condition). A doctor should be consulted if complications develop from a lice infestation or if a child contracts a bacterial infection from scratching the bites. Lice usually are diagnosed by the itching; however, itching may not occur until several weeks after infestation, if at all. The tickling caused by moving lice may be noticeable. Definite diagnosis requires identification of lice or their nits. Head lice may cause irritability in children and scalp irritations or sores may be present. Head lice in children are usually confined to the scalp. An adult louse may be visible as movement on the scalp, especially around the ears, nape of the neck, and centerline of the crown, the warmest parts of the head. Since less than 20 mature lice may be present at a given time during infestation, the nits often are easier to spot. Nits vary in color from grayish-white to yellow, brown, or black. They are visible at the base or on the shaft of individual hairs. Applying about 10 oz (280 gm) of isopropyl (rubbing) alcohol to the hair and rubbing with a white towel for about 30 seconds releases lice onto the towel for identification. Body lice appear similar to head lice; however, they burrow into the skin and are rarely seen except on clothing where they lay their nits in seams. Over time body lice infestations can lead to a thickening and discoloring of the skin around the waist, groin, and upper thighs. Pubic lice usually appear first on genital hair, although they may spread to other body hair. In young children pubic lice usually are seen on the eyebrows or eyelashes. Pubic lice appear as brown or gray moving dots on the skin. There are usually only a few live lice present and they move very quickly away from light. Their white nits can be seen on hair shafts close to the skin. Although pubic lice sometimes produce small, bluish spots called maculae ceruleae on the trunk or thighs, usually it is easier to spot scratching marks. Small, dark-brown specks of lice excretion may be visible on underwear. Since pediculicides (medications for treating lice) are usually strong insecticides with potential side effects, it is important to rule out other causes of scratching and skin inflammation. Oval-shaped head lice nits can be distinguished from dandruff because they are glued at an angle to the hair shaft, whereas flat, irregularly shaped flakes of dandruff shake off easily. Most authorities believe that head lice should be treated immediately upon discovery. Before beginning any treatment, parents should test a small scalp section for allergic reactions to the medication, use a vinegar rinse to help loosen nits, and wash hair with regular shampoo. Infested eyebrows should be treated with petroleum jelly for several days and the nits should be plucked off with tweezers or fingernails. Infested eyelashes are treated with a thick coating of prescription petroleum ointment, applied twice daily for ten days. The treatment for body lice is a thorough washing of the entire body and replacement of infected clothing. Clothing and bedding should be washed at 140°F (60°C) and dried at high temperature or dry-cleaned. Head and pubic lice infestations usually are treated with insecticidal lotions, shampoos, or cream rinses. These pediculicides should not be used on children under two; near broken skin, eyes, or mucous membranes; in the bathtub or shower; by those with allergies , asthma , epilepsy, or certain other medical conditions. Itching may not subside for several days following treatment. All U.S. Food and Drug Administration (FDA)approved non-prescription pediculicides contain relatively safe and effective pyrethroids. Insecticidal pyrethrins (0.33%) (RID, A-200) are extracts from chrysanthemum flowers. Permethrin (1%)(Nix) is a more stable synthetic pyrethrin. Pyrethroid pediculicides also usually contain 4 percent piperonyl butoxide. Pyrethroids are applied for a specified length of time (usually ten minutes) and then thoroughly rinsed out. The hair should not be washed for one or two days after treatment. Cream rinse, conditioner, hair spray, mousse, gel, mayonnaise, or vinegar should not be used before treatment or within one week after treatment since these products can reduce pediculicide effectiveness. Malathion (0.5% in Ovide), a neurotoxic organophosphate, was withdrawn from the U.S. market due to an increase in malathion-resistant lice. It was reintroduced in 1999. It is foul-smelling and flammable. Sometimes infested clothing is treated with a 1 percent malathion powder. Lindane (1% or higher) (Kwell), an organochloride neurotoxin, can induce seizures and death in susceptible people, even when used according to the directions. In 2003 the FDA required new labeling and a reduction in bottle size. Ivermectin (Stromectol), an oral treatment for intestinal parasites, is effective against head lice but as of 2004 had not been approved for that use by the FDA. Experts disagree about the effectiveness and/or safety of pediculicides. Pediculicides do not kill nits, so nit removal and a second application in seven to 10 days are required. During the 1990s, as schools began requiring children to be lice- and nit-free, the use of pyrethroids rose significantly and the FDA began receiving reports of their ineffectiveness. Pediculicides can be poisonous if used improperly or too frequently and overuse can lead to the proliferation of chemically resistant lice. Pediculicide residue may remain on the hair for several weeks and can cause skin or eye irritations. cocamide DEA (a lathering agent), triethanolamine (a local irritant), and disodium EDTA (a chelator) (SafeTek) are both a nontoxic pediculicide and a conditioner for combing out lice and nits. A common herbal treatment for pubic lice consists of pennyroyal oil (25%), garlic oil (25%), distilled water (50%). The mixture is applied to the pubic hair once a day for three days. Treatment does not kill all lice nits. Hair and pubic lice nits must be removed manually to prevent re-infestation as the eggs hatch. Manual removal alone may treat a lice infestation effectively. In addition, hair should be clean, damp, and untangled; clothing should be removed and a towel placed between the hair and shoulders; the hair should be divided into square-inch sections with the use of clips or elastics to divide long hair. Head lice nits are removed by combing through each hair section from scalp to tip. Between each passing, the comb should be dipped in water and wiped with a paper towel to remove lice and nits. The comb should be held up to the light to be sure it is clean. If necessary the comb may be cleaned with a toothbrush, fingernail brush, or dental floss. Good light and possibly a magnifying glass are required. Long, thick hair may take an hour to comb out thoroughly. Towels and clothing should be washed after combing. The process should be repeated at least twice a week for at least two weeks. Nits also can be manually removed with any fine-toothed comb, including pet flea combs, a specialized nit comb (LiceMeister, LiceOut), a battery-powered vibrating or anti-static comb, tweezers, baby safety scissors, and fingernails. A close-up view of a body louse. Re-infestation with body or pubic lice can be prevented by washing underclothes, sleepwear, bedding, and towels in hot, soapy water and drying with high heat for at least 20 minutes. Clothing infected with body lice should be ironed under high heat. Lice infestations are not usually dangerous. Despite the presence of chemically-resistant lice and the thoroughness required to prevent re-infestation, all lice infestations are eradicated eventually. Prevention of lice infestation depends on adequate personal hygiene and consistently not sharing combs, brushes, hair accessories, hats, towels, or bedding. Hair should be checked weekly for lice and nits. Regular lice checks in schools and "no nit" reentry policies have not been shown to be effective. The American Academy of Pediatrics, the Harvard School of Public Health, and the National Association of School Nurses recommend their elimination, although many healthcare professionals disagree. Scratching or scraping at lice bites may cause hives or abrasions that can lead to bacterial skin infections. In developing countries head lice infestations are a significant cause of contagious bacterial infections. Body lice can carry and transmit disease-causing organisms. Although pubic lice do not carry diseases, they often are found in association with other sexually transmitted diseases . 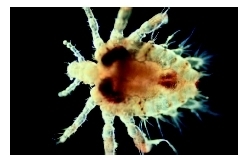 Crab lice in children may be an indication of sexual activity or abuse. Crabs —An informal or slang term for pubic lice. Endemic —Natural to or characteristic of a particular place, population, or climate. Insecticide —Any substance used to kill insects. Lindane —A benzene compound that is used to kill body and pubic lice. Lindane is absorbed into the louse's central nervous system, causing seizures and death. Malathion —An insecticide that can be used in 1% powdered form to disinfect the clothes of patients with body lice. Neurotoxin —A poison that acts directly on the central nervous system. Nits —The eggs produced by head or pubic lice, usually grayish white in color and visible at the base of hair shafts. Pediculicide —Any substance that kills lice. Permethrin —A medication used to rid the scalp of head lice. Permethrin works by paralyzing the lice, so that they cannot feed within the 24 hours after hatching required for survival. Petroleum jelly or ointment —Petrolatum, a gelatinous substance obtained from oil that is used as a protective dressing. Piperonyl butoxide —A liquid organic compound that enhances the activity of insecticides. Pyrethrin, pyrethroid —A naturally occurring insecticide extracted from chrysanthemum flowers. It paralyzes lice so that they cannot feed. Derkazarian, Susan. You Have Head Lice! Danbury, CT: Scholastic Library Publishing, 2005. Grossman, Leigh B. Infection Control in the Child Care Center and Preschool. Philadelphia: Lippincott Williams & Wilson, 2003. Official Patient's Sourcebook on Head Lice Infestation. San Diego, CA: Icon Group International, 2002. Blenkinsopp, Alison. "Head Lice." Primary Health Care 13 (October 2003): 33–4. Burgess, I. F. "Human Lice and Their Control." Annual Review of Entomology 49 (2004): 457. Elston, D. M. "Drug-Resistant Lice." Archives of Dermatology 139 (2003): 1061–4. Evans, Jeff. "Pediatric Dermatology: Simple Methods Often Best: Lice, Mosquitoes, Warts." Family Practice News 34 (January 15, 2004): 56. Flinders, David C., and Peter De Schweinitz. "Pediculosis and Scabies." American Family Physician 69 (January 15, 2004): 341–52. Heukelbach, Jorg, and Hermann Feldmeier. "Ectoparasites—The Underestimated Realm." Lancet 363 (March 13, 2004): 889–91. Kittler, R., et al. "Molecular Evolution of Pediculus humanus and the Origin of Clothing." Current Biology 13 (August 19, 2003): 1414–17. "Recommendations Provided for Back-to-School Head Lice Problem." Health & Medicine Week (October 6, 2003): 329. Yoon, K. S., et al. "Permethrin-Resistant Human Head Lice Pediculus capitis , and Their Treatment." Archives of Dermatology 139 (August 2003): 994–1000. Zepf, Bill. "Treatment of Head Lice: Therapeutic Options." American Family Physician 69 (February 1, 2004): 655. American Academy of Dermatology (AAD). PO Box 4014, Schaumburg, IL 60168-4014. Web site: http://www.aad.org. American Academy of Pediatrics (AAP). 141 Northwest Point Boulevard, Elk Grove Village, IL 60007-1098. Web site: http://www.aap.org. Centers for Disease Control and Prevention. National Center for Infectious Diseases, Division of Parasitic Diseases. 1600 Clifton Road, Atlanta, GA 30333. Web site: http://www.cdc.gov/ncidod/dpd/parasites/lice/default.htm. National Pediculosis Association (NPA), Inc. 50 Kearney Road, Needham, MA 02494. Web site: http://www.headlice.org. "Lice." MayoClinic.com , August 5, 2002 Available online at http://www.mayoclinic.com/invoke.cfm?id=DS00368 (accessed December 29, 2004). "Lindane Shampoo and Lindane Lotion Questions and Answers." Center for Drug Evaluation and Research, U.S. Food and Drug Administration , April 15, 2003. Available online at http://www.fda.gov/cder/drug/infopage/lindane/lindaneQA.htm (accessed December 29, 2004).